Cloud computing is dominating the radars of CIOs and technology leaders at higher education institutions across the United States, but deployment of cloud-hosted solutions for more mission-critical work has been slower than expected. 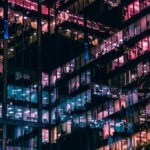 Without question, cloud computing looms large as the technology that will provide the foundation for administrative and operational systems in the consumer, corporate, and campus markets in the coming years. Of course, as with other new technologies, a proclamation about—or high expectations for—the impeding arrival and significance of cloud computing may not match its actual deployment, timeline or experience. For example, in her introduction to the 2008 EDUCAUSE volume, The Tower and the Cloud, then EDUCAUSE president Diana Oblinger characterized the coming of the cloud as “a future that may arrive faster than we expect.” In contrast, data from the fall 2015 Campus Computing Survey reveal that that less than a fifth of colleges and universities expect to have key, mission-critical administrative applications such as human resources, institutional finance, and student information systems running on cloud applications five years from now—by fall 2020. CIOs and senior campus IT officers across all sectors of higher education report that Cloud Computing really does loom large in the future of their institution. What’s striking about these numbers is that they are fairly consistent (and high!) across segments and sectors—from community colleges to research universities. Only the cost issue shows interesting variability: here the numbers range from 90 percent of the CIOs in private research universities who expect cloud computing to help reduce IT costs, to 81 percent in public BA/MA institutions, and 57 percent in community colleges. Consequently, what emerges from these data is not the question of if cloud computing will be important across all sectors of higher education. Instead, the focus becomes when cloud computing will arrive and what factors will accelerate or impede its arrival and implementation. Technical specialists will tell you that there are different types of clouds such as public clouds (which are open to multiple users or organizations) and private clouds (where services are dedicated to single user or organization). There is also, as might be expected, an alphabet soup of acronyms about cloud computing that include SaaS (Software as a Service), PaaS (Platform as a Service) and IaaS (Infrastructure as a Service). 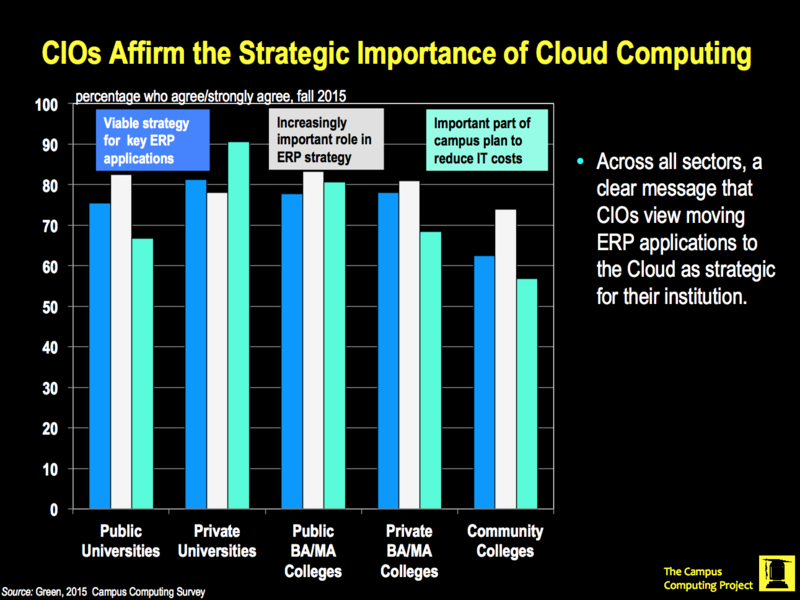 Yet the Campus Computing Survey data also point to a typology of clouds. Drawing of the metaphor of “low-hanging fruit,” there are clearly low-, middle- and high-cloud applications. “Low-Cloud” applications are those functions such as personal email and calendars that have already migrated to cloud platforms on most campuses. Colleges and universities across all sectors institutions have (readily!) accepted an offer from either Google or Microsoft for free hosting services for student (and sometimes faculty and administrative) email services. On a day-to-day basis, you may not know (or care) that Google or Microsoft services student email at your institution. However, it makes a significant difference in the back room and for institutional IT budgets when campuses do not incur the operating and support costs for email and calendar services. 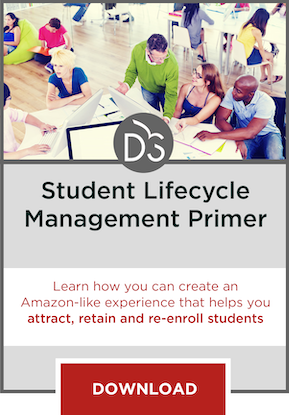 The “Middle-Cloud” applications refer to Learning Management Systems and Analytics (including “Customer Relationship Management”—CRM) that are already running on cloud platforms at about a third or more of two- and four-year colleges and universities. 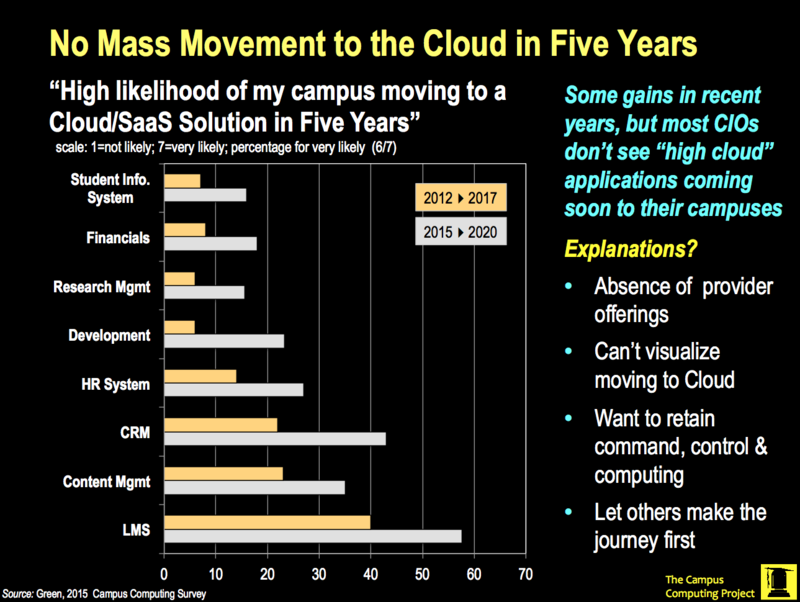 The foundation for these applications is now in place, and the trajectory for the migration of more campuses to cloud computing for these services seems clear and certain. Finally “High Cloud” applications are the very large, complicated, complex, and mission-critical administrative software functions that include finance, human resources, and student information systems. While the numbers may vary somewhat by technology provider, to date relatively few institutions have deployed these key administrative applications on the cloud. Yet for most colleges and universities, these mission-critical high-cloud applications are not a matter of if they move to the cloud, but when. Despite the continuing discussion in the corporate, consumer, and campus sectors about the impending arrival of cloud computing, the fall 2015 survey data reveal current deployment levels of key applications are low—often less than ten percent of campuses within various sectors. Several issues seem to be delaying the implementation of cloud computing in higher ed. One is that campus IT officers are waiting (some report “still waiting”) for their technology providers to provide a clear (and compelling) path to cloud computing for current, mission-critical administrative/ERP campus applications such as such as development, finance, human resources and student information systems. These applications traditionally have been hosted (locally installed and managed) at the individual campuses: the college or university buys or licenses/leases the software application, along with the supporting hardware and related technology, and also is responsible for managing the application and providing user support. A second key issue for many IT officers is risk: as an “industry,” higher education is understood to be (highly) risk aversive. Consequently, few institutions (and campus IT leaders) want to be the first among their peers to take a Columbus-like “Journey of Discovery” into new (technological) waters. Rather the general tendency is to wait and to watch the experience of the early adopters, so as to learn from it: What worked? What did the early adopters and their technology partners do well? What could have or should have been done better? These factors help to explain the low deployment levels, to date, for the key, mission-critical “high-cloud/high-value” cloud applications. IT security is (or should be) a major institutional concern, and not just for CIOs and senior campus IT officers. An IT breach may expose a college or university to significant liability problems and will often involve significant time and expense to remedy and resolve. The underlying security concern about cloud computing for many CIOs and senior campus IT officers is “where are my data?” At present for most institutions, key administrative applications are typically running on systems that are located (hosted) on the campus: you know the physical location of your data and you also know the people responsible for the security of your institution’s data. But when your applications and data migrate to the cloud, you may not know much about the “where and who”—and what measures your cloud provider (and perhaps the cloud provider’s subcontractors) have taken to protect your data. These issues help explain why a significant minority of CIOs and senior campus IT offers have concerns about IT security in the cloud. In fall 2015, 70 percent of CIOs agreed “cloud computing services offer a level of data reliability and security that equals or exceeds the level of security and reliability we can provide with on-campus hosting.” Conversely, this means that almost a third (30 percent) disagree with this statement, believing that their college or university IT unit can provide better IT security for campus data and resources than commercial cloud computing providers. Additional data from the fall 2015 Campus Computing Survey appear to reinforce the security concerns of some CIOs: a small number of campuses (6 percent) reported an IT security incident linked to cloud computing in the past academic year (2014-15). Moreover, a fifth of the CIOs/senior IT officers who participated in this year’s Campus Computing survey expressed “high concern” for an IT security incident involving cloud computing at their institution in the coming year (2015-16). Admittedly, we are still in the early stages of deploying cloud computing for major administrative applications. But the data, even in fall 2015, suggest that data security in the cloud is and will remain a major deployment concern for many CIOs and senior campus IT officers. So if the current deployment numbers for “high-value/high-cloud” ERP applications are low, will they snowball in the coming years? If only 10 percent of campuses currently deploy a cloud-based ERP application, could that number jump to 30 or 40 percent in five years? That seems unlikely given the expectations of CIOs. 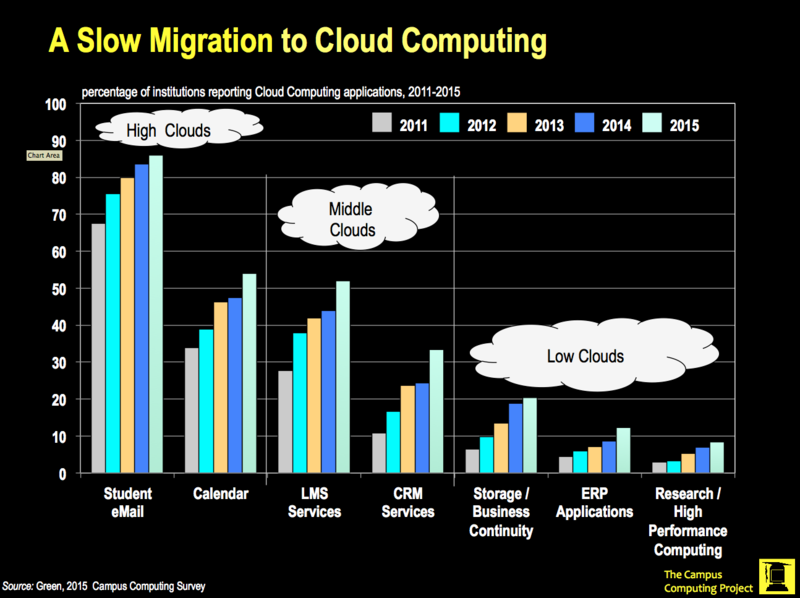 The fall 2015 Campus Computing data suggest no mass movement to cloud computing in the next five years. Fewer than 20 percent of CIOs expect their institutions to be operating on high-cloud/high-value ERP applications (e.g., finance and student information systems) by fall 2020. Admittedly, cloud deployment may accelerate over the next five years. But the deployment process is a long one. It typically takes a year (often longer) to review, assess, and plan and, then another year (or more) for the transition, which involves both technology and training. Beyond the survey data, which tell us that cloud computing for administrative applications is coming, if slowly, what else should we know? Here the discussion from a panel session on cloud computing at the recent EDUCAUSE conference becomes informative. Panel participants agreed that cloud computing may be a catalyst for a new kind of shopping and licensing strategy. In the past, colleges and universities often opted for a single suite of ERP or administrative applications from one vendor. 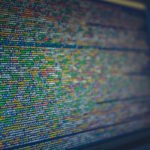 The notion was that data integration across applications from just one technology provider would be easier than attempting to integrate data across applications from several different technology companies. But the single suite strategy often left some campus IT officers feeling that they were not always getting the “best of the breed” by buying the suite: Acme Administrative Applications might have a great finance or HR application, but its SIS was not as good as the one from Omega Technologies. Yet the campus might ultimately settle for the SIS from Acme, in order to facilitate data integration and application deployment. 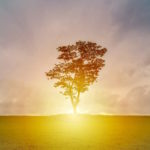 Data integration via the cloud may mean that there is no more settling for an acceptable application, rather than selecting the one assessed to be the best. And that would be a major change for many colleges and universities. CAN WE? What is the timetable for cloud applications from my ERP provider? COULD WE? What will the transition process be for our technology, for our IT unit, and for the campus? WHY SHOULD WE? 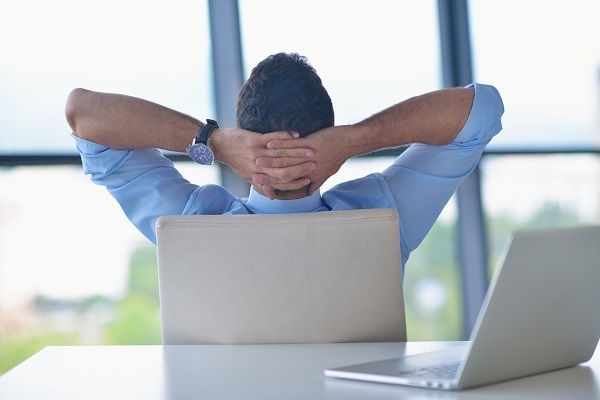 What are the benefits of moving to cloud-based ERP applications? WHAT WILL IT COST? Will migrating to the cloud save us money? If so, how? Can we document the savings? WHEN DO WE? What is the transition schedule? What are the key transition issues? WHAT CAN OTHERS TELL US? Can we benefit from the experience of others? WHAT DON’T WE KNOW TO ASK? We don’t know what we don’t know. HOW DO WE ASSESS SUCCESS? What changes? How do we assess the effectiveness of our efforts to migrate to the cloud? As with most other technology issues in higher education, the key questions about cloud computing are not about the technology, per se, but about how to deploy and make effective use of the technology. To download the 2015 Campus Computing Survey, please click here. I’m a little surprised by the numbers about how many institutions will be switching over the next few years. The way I’ve been hearing it talked about, everyone and their dog is convinced it’s the best solution and expect everyone to already be in the process of transitioning. Interesting to see some hard data on it. I’m more surprised by the 30 percent of IT officers who believe they can handle data security better than cloud providers. With so much at stake, it really is the cloud providers business to ensure they’re the best in security. Also I believe the data so far reflects that fact, there’s a pretty convincing argument to be made that your data is safer in the cloud. It’s good to see some really detailed breakdown of what the cloud actually means right now and what it could mean in future. It’s easy to forget that the ability to effectively deploy new technology is more important than the new tech itself. I think the numbers about who believes they will save money using the cloud are particularly telling. We need to be careful we’re not just caving to trends without doing all the research.